So I was at work, in a large, open floor plan of an office space, with a dozen workstations and a handful of co-workers scattered about, when we were all startled by a loud, sickening thump on one of the large windows. It was the kind of thump we’d all heard before, and we rushed outside to confirm our suspicion that one of nature’s glorious winged creatures had mistaken the reflection in the window of the nearby trees for the real thing. We all stood around the poor, beautiful critter, there was no detectable movement, not even a gentle a rise and fall of the chest, and I felt this deep pain and a kind of shame. Years ago I had a very similar experience, also at work but a different job, and I was with someone knowledgeable, who rushed to pick up the bird, engulfing it gently but completely in her hands, explaining that oftentimes the bird is just stunned, but could go into shock and die. And like a miracle, after keeping the little thing warm for a few minutes, it started to wriggle with vigor, my co-worker opened her hands, and the bird flew off. With that in mind, I quickly reached for this morning’s bird, but as soon as I had the delicate thing in my hands — such an unbelievable light and delicate thing for something rather large, smaller than a crow, but larger than a robin — I could tell right away that it was futile. Still, after assuring everyone that I would place the bird somewhere in the nearby woods where it wouldn’t be trampled on, I held onto it for a while, after everyone else had returned to the office, and I gently stroked its downy chest, aching inside for this senseless death. We have those big windows in the office because we desire natural light in the work place and we enjoy being able to see the trees about 10 feet away. Oh, the tragic irony, that those trees can be so pleasing and comforting for us, looking out, and yet so deadly for the birds looking from the other side. Thanks for the visit and the comment, OhWayCho! It is very sad and happened to me many times when I lived in Ireland, some I was able to save but some seemd to have their necks broken on impact. We had alareg double glazed window that went almost to the ground and I remember someone telling me it happens more with double glazing for some reason.. though I cannot remember the exact reason why..
Hmmmm, not sure if the windows are double -glazed or not, Helen. I wasn’t aware that that could be a factor. I’m still sad about it today, and looking at the photo above is still heartbreaking. 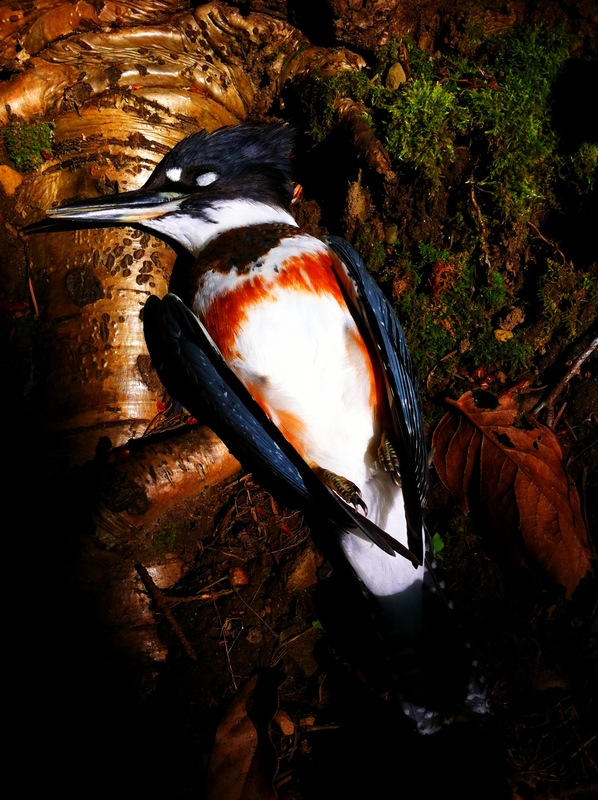 Really very sad.It is a really beautiful looking bird. I have one way glass on my windows.They look like mirrors from the other side.Since the last 2 years a pair of sunbirds have chosen the bushes round my apartment to build their nest.The reflection on the windows seems to drive the male bird crazy and it spends hours pecking at an imaginary foe. I have tried opening/partially opening the windows to try to give him an idea that there is no foe,but he just doesn’t get it.I can’t keep the windows open all the time for fear of my cat. Strangely the windows bother no other species of birds.Crows may seem to peck at the glass occasionally, but they are catching insects. That’s a funny image, of the sunbirds pecking at their own reflections. Glad to hear they’re not smashing into the window. Thanks for the visit and the comment! such a sad and beautiful image.